- Constructed from Heavy Duty PVC Material. - Main compartment: 45 L X 10 H X 4 D.
- Heavy Duty zippers. The Main double rifle compartment also has snap buttons to secure the compartment. - Padded panels to protect your valuables. - Four zippered external compartments. - The Rectangular compartment: (12 L X 9 H X 2 D) with another zippered compartment on the outside (12 L X 9 H) The Smaller Long tapered compartment: (23 L X 4 H X 2 D). - The Larger Long compartment: (23 L X 4 H X 2 D). 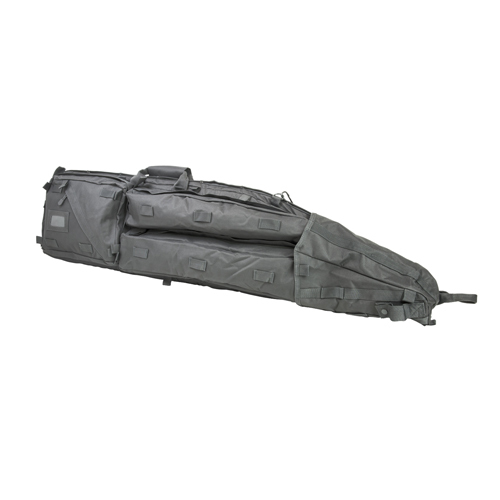 - Two shoulder straps & sternum strap provided allows you to carry the Drag Bag like a back pack. A third shoulder strap is also provided.